Week 10: Went by fast! 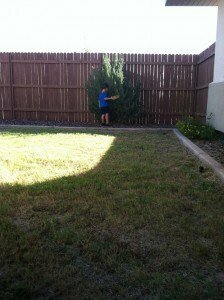 Last week (Week 10 of homeschooling) went great. I am reaching the 8th month post-partum, so the hormonal imbalances should be subsiding soon and I feel more energetic, even though I am not 100% yet. Giving birth can really take a toll on one’s body, even though you are eating right and staying fit, especially so if you let a little something called STRESS sneak into your life on a daily basis. It is normal to feel stressed when big changes come to our lives. One of our biggest changes was the birth of our daughter. All of a sudden, we had a toddler and a newborn and things felt like they were spinning out of control some days. On top of all that, she turned out to be very high maintenance (at least compared to our son). So we all had to adjust to their individual needs. It has been stressful the last few months, yes, but it has been wonderful at the same time and, if I had the chance, I’d do it all over again in a heartbeat. I love my children beyond words and being a mother is the most challenging, humbling, and growing experience I have ever gone through. It has truly made me a better person. I have understood God’s love for me better. I have realized that two pairs of little eyes are always watching and absorbing everything. They have taught me to laugh so much more than before and to capture and enjoy the simple things in life. If it were for my daughter, she’d be the happiest baby on earth if I were to hold her on my lap and we stare and smile at each other for hours on end. It is the sweetest thing to feel so needed and loved. Breastfeeding has definitely made our bond stronger. I feel so blessed to be able to breastfeed. It is so rewarding! All in all, being a parent makes one feel “lost” at times, but we find ourselves again in our little ones’ eyes. Sigh…lovely! This week, K worked with the number spindles. He enjoyed it and caught on quickly. After half a demonstration, he was doing the activity all by himself. He liked it so much that he kept doing it over and over. 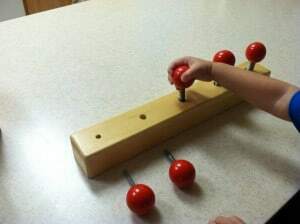 child then puts the corresponding number of spindles in the slots. For example, the 0 gets no spindles, the 1 gets one spindle, etc. 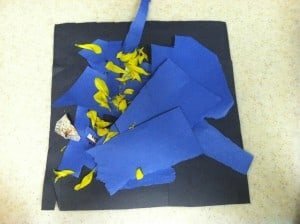 This is a work of art that consists of cut up construction paper, glue, and flower petals. 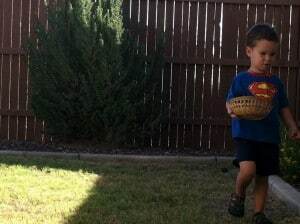 For science/art, K went around the backyard looking for stuff in nature. 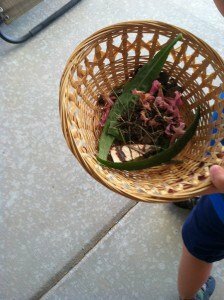 He collected leaves, flowers, rocks, dirt, dried grass, and some seeds. He glued all of the items on black construction paper. This is what it looked like in the end. Beautiful! 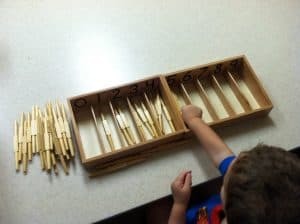 This is another Montessori Sensorial activity. It is Color Box #1. It is quite simple, just matching the three primary colors as he manes them. I made it a bit more interesting. First, he named the colors (super easy). Then he matched the colors (like you see in the picture above). but he caught on quickly and was successful at replicating every pattern. This week, I did try a couple of new recipes, including baked eggrolls that were a big hit. They did have a little bit of ground beef, but they were about 80% veggies. They were delicious. I am collecting some egg cartons to start to plant my seeds for our fruit and veggie garden. I went to a meeting a couple of weeks ago where a horticulturist taught us how to plant and when to plant a garden. I am excited to get started again and I am hoping that it’ll be a successful project, especially now that I have learned some important tips. I’ll update on this project every week or two. On a different note, I ordered some grapeseed oil to try because its flavor is neutral and it can substitute butter in baking recipes. I really like it! You should research it’s nutritional and healing properties; it’s truly incredible. I am now going to alternate using it and coconut oil, which is also an awesome product. Homemade toothpaste: I made my second batch last week with a few changes and I must say, wow! Make a paste with all of the ingredients above until desired consistency. It will thicken up if it is cold and it will be more oily if it is warmer (properties of coconut oil). Same thing as above. Make a paste until desired consistency. I made this one last week and I am loving it. The egg shell has calcium, which helps strengthen teeth, but the fact that it is a powder, it helps to remove plaque and other impurities on the surface of the teeth. I don’t want to overdo it, so I will alternate between the two. Oil Pulling: All I can say is whoa! I had hear about it, but after talking about it with my neighbor, I became even more curious and decided to try it. I am in shock at how well it works. Visit this Oil Pulling Website and learn all about it. In my experience, I used sesame oil and have done it a couple of times. I have felt more energetic and I can see that my teeth are whiter (already, yes, already). It is so simple and so natural that I can see myself using this as a remedy to many ailments, not just to whiten and strengthen teeth. Check it out!